The future is Now. The virtual reality was a fake tale just before some years. Now, it’s been the futurist invention that put the whole world inside a simple workstation. Virtual reality already proved the way to get into the virtual world from your bedroom itself. To enjoy in a roller coaster, to have a skydive, to travel across those Venice gardens, you never again need to take a ticket. The virtual reality makes it possible to enjoy all in a simple gadget. More than watching a video of a lovely place or having a game session using that old keyboard and mouse method, the Virtual reality makes you a superhero. Near months, we have seen many VR gadgets out on the market. But, the Virtuix Omni is something very different from just Virtual Reality. The VR treadmill is something gigantic when compared to your PS3 console or Xbox. It’s never been easier to control the gaming characters with the initial virtual reality controllers. But, in the case of the Virtuix Omni, the things are far beyond the past. It provides a completely virtual environment in a 2 feet area. Here is a video of the Virtuix Omni that describes what it is actually. As you seen in the above video, it’s a 360-degree virtual reality controller, specially made for gaming purposes. It has many parts that help to provide a complete virtual eco-system. The things looks like a gigantic device which is similar to the treadmill at the gym. Users could easily walk through the surface by wearing a specially made shoes with sensors. The device captures the foot motion and easily navigate you through the game. There is a belt which will be attached to the hip that also captures the motion of the body to crouch and walk lower on the games. The highly sensible sensors can always output the desired results right in front of you. This is how the product looks like. All can be seen through the VR headset attached in front of your eyes. The 360-degree visuals will beat the natural views on the earth. You will feel like the shooter on the Battlefield, hero of the Call of duty, and the Villian in GTA 5. 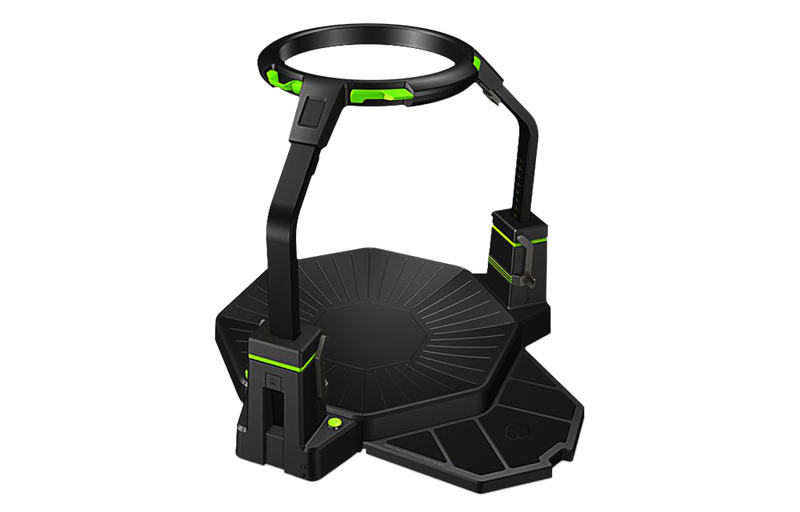 The Virtuix Omni is compatible with almost all devices except the gaming consoles like Xbox and PS3. You could now enjoy the power of virtual reality through the real virtual Omni. There are much more features for the product. So, let’s have a look. The Virtuix Omni let you control the gaming characters as you were them. The characters will imitate your exact movements. Just walk on the slippery surface to get your character walking, walk lower to make your character do the same or crouch. The hip belt will balance you in comfort. You will have a duplicate gun on your hand and just imitate the desired actions like shooting kicking and anything you do with your keyboard and mouse. You could walk on the surface as you walk on the real ground. But may feel some difficulties in initial days of use. You won’t feel like walking on a normal treadmill in Gym. It need your feet and surface touch to get the sensors working. But, it’s very similar to the real life walking. You won’t mistakenly walk on to the walls. The Omni will hold you in the exact position where you are. So, a virtual environment is created in an area less than 2 feets. So, be ready to walk on the Virtuix Omni. Next time control your Battlefield hero with the VR workstation. The Virtuix Omni supports a vast range of devices or almost all devices. As per the company, you could enjoy the product with your PC, Smartphones, Mac and almost all devices will seamlessly connect with the Omni. But the gaming platforms like Xbox and PS3 is not likely to support the product. But, in a meeting, the company announced that they are working on the Gaming console compatibility of the device and will soon finish it and make it work on the gaming consoles. The product in not something which is in your hands, it’s bigger that makes it better to use. Actually, the Virtuix Omni is not with you. You are inside the Omni. It provides an elegant feel with a completely virtual environment that controlled by you. The gadgets like Sensor Shoes, VR headset, Hip Motion Analyser Belt, Slippery Surface all makes it completely realistic. Gaming is one of the most popular entertainment methods all over the world. The manufacturers have been enhancing the gaming peripherals day by day with advanced technologies. The Virtuix will be a revolution on the gaming because it implements a most realistic way of enjoying the games. Gone are the days when the gamers used to sit on a chair all day and night and played games for a while that caused a lot of stress and strain. No more the games are just around a chair. The realistic gaming is the trendy way of enjoying the games in your own way. The futuric inventions will exhibit many changes in the VR gaming. Now, you got up from the chair for the gaming in Virtuix. Near future, you will run in a virtual environment, and you will be the real hero of a heroic game. It’s not far the future where you could be the shooter of your favorite Call of Duty or Battlefield.